Fairfax Neonatal Associates, P.C. (FNAPC) is a private, pediatric multi-specialty group committed to providing the best possible care for premature and critically-ill newborns and pediatric patients. We are dedicated to supporting the needs of both patients and their families. FNAPC is comprised of the following pediatric specialties: neonatology, pediatrics, pediatric pulmonology, allergy and immunology, pediatric surgery, and pediatric sleep medicine. Our vision is to continually seek to improve the pediatric specialty care we provide by incorporating optimal evidenced-based practices and the latest medical innovations to achieve the best possible health outcomes. Fairfax Neonatal Associates, P.C. (FNAPC), started one of the first neonatal intensive care units in Northern Virginia with seven beds, at the Fairfax Hospital in 1973. Today, our neonatologists provide 24/7 coverage at several hospitals, including the Inova Children’s Hospital, the only pediatric hospital in the northern region of Virginia. FNAPC has over 65 active physicians and professionals who provide neonatology and pediatric specialty care. FNAPC is devoted to providing exceptional quality of care to Northern Virginia’s tiniest newborns to young people up to age 21. Learn more about our Quality & Research activities. After beginning at the Inova Children’s Hospital, Fairfax Neonatal Associates expanded its services to provide neonatology and pediatric hospitalists at Inova Fair Oaks Hospital, and neonatology coverage at Inova Loudoun Hospital. FNAPC recognized the advantages of pediatric subspecialty care organized under one collaborative organization, and partnered with or recruited new members to establish a highly respected team of neonatologists, pediatric specialists, pediatric hospitalists, other clinicians, and support staff. More detailed information about our providers may be found in the Provider directory. FNAPC partnered with The Pediatric Lung Center (PLC) to develop one of the first pediatric pulmonology groups in Northern Virginia dedicated to outstanding specialty care for infants and children with complex respiratory illnesses, including cystic fibrosis. 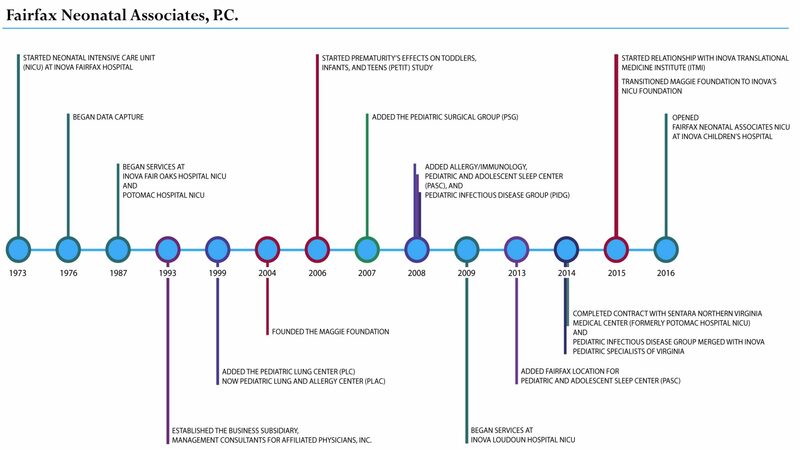 The addition of allergy and immunology enabled us to subsequently rename PLC to Pediatric Lung and Allergy Center (PLAC). The PLAC physicians maintain privileges at Inova Children’s Hospital, and see patients by appointment in their private medical offices in Fairfax and Leesburg, Virginia. Pediatric and Adolescent Sleep Center (PASC) opened the first sleep medicine clinic in Purcellville, VA that is 100% dedicated to pediatrics. PASC expanded its team and services to Fairfax. Both locations exclusively serve young patients under age 21, and are accredited by the American Academy of Sleep Medicine. The Pediatric Surgical Group (PSG) joined the practice and added highly-skilled pediatric surgeons to provide consultations and surgical treatments for neonates, children and teens in Northern Virginia. The pediatric surgeons are available at the Inova Children’s Hospital/Inova Fairfax Hospital, Inova Surgery Center, and their private offices in Fairfax and Leesburg, Virginia. FNA’s Neonatology team forged a relationship with the Inova Translational Medicine Institute (ITMI) to perform research and analysis relating to genomics and premature births. Responding to the complexity of our medical practice, we created a management service organization in 1993: Management Consultants for Affiliated Physicians, Inc., a fully owned business subsidiary. FNAPC is honored to build strong collaborative relationships with our medical colleagues as well as the hospitals, facilities and networks we serve in order to provide the best possible care for our patients and their families.